Value education means inculcating in the children a sense of humanism, a deep concern for the well-being of others and the nation. 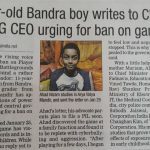 We take great pride in sharing the exceptional and thoughtful initiative by our young Ahad from Std-6 who has imbibed the moral values instilled through the school system. 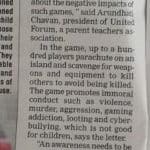 Mst.Ahad Nizam of Std.VI B had written a letter to the CM and the CEO of PUB-G urging the ban on PUB-G game. The attached article appeared in the daily, DNA dated 1stFebruary, 2019. Well done Ahad ! We expect all our students to follow him and create an environment of tolerance, respect for others and cooperation for a better world.